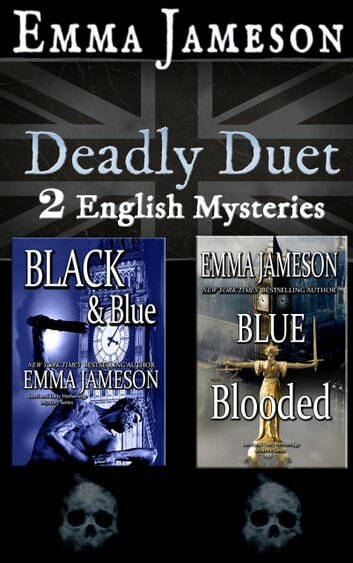 Two of Emma Jameson's best mysteries, now in one volume! If you haven't tried these romantic, witty cozies, Deadly Duet is the perfect place to start. Lord Anthony Hetheridge, a legend at Scotland Yard, has just married Detective Sergeant Kate Wakefield. The newlyweds couldn't be more different. Tony Hetheridge is sixty, blue-blooded, and the perfect English gentleman sleuth. Bold, blonde Kate is thirty-three, working class, and modern London to the bone. Falling in love with Kate turned Lord Hetheridge's life upside down, and he wouldn't have it any other way. In Black & Blue, Tony, Kate, and DS Deepal "Paul" Bhar take on the death of a widely-hated art dealer. Was it counterfeits that brought him down, or drug smuggling, or his parade of scorned women? In Blue Blooded, Tony, and Kate, and Paul face perhaps their greatest challenge when the fiendish Sir Duncan Godington returns, bent on revenge. 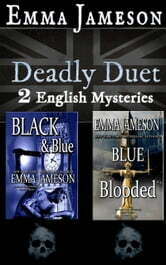 Two terrific English mysteries at one special price, for a limited time only. Nice easy reading with still enough suspense. Will have to keep an eye open for other books by Emma. These two mysteries are great fun, but mostly very thrilling murder investigations. The characters are complex and very believable. I hope there will be many more to read! Loved these two books following up the Hetheridge clan. Old fashioned crime in a modern setting. True psychopathic serial killer story with great humour and pathos. Looking forward to continuing the saga. I absolutely loved these 5 books, read them consecutively over 3 days! Was pleased I was able to do this as didn’t have to tax my memory overly! A definite advantage @ 73! The books are well written, humour is included & the plot’s twists & turns are believable but still intriguing! Emma can be proud of her skill ! Dunno why will not allow me to place s at end of Series!! Just finished books 4 and 5, going to see if there is another one.